"Thanks very much for following up with us. Yes, it arrived safely, and we absolutely love it. The quality is excellent, and it gives us a very special place to keep our beloved Tigger. 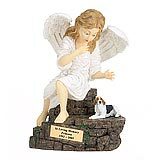 We still have 4 living cats, and a Siberian Husky, so when that awful time comes again, we may be placing another order." 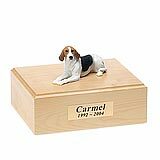 All available American Foxhound dog urns and memorials will be displayed with the figurine on the American Foxhound urn you select and in the appropriate size.